In 2003, we received the books of Piet van der Loon, who had left them to us in his will. Piet died in 2002, and is buried in the graveyard of St Peter’s Church at Wootton at the foot of Old Boar’s Hill near Oxford, where he lived in the house called “Midhurst” until the time of his death. I will give an account of his remarkable collection in a later posting, but for now it need only be pointed out that he had what was probably the finest personal collection of Chinese books in Europe, amounting to some 10,000 volumes occupying over 250 metres of shelving. Even now, we are still going through it. On the front cover, Piet wrote “Rarissimus! 1906”, and on the back “Foochow dialect. 1906. No other copies are known”. What a dangerous thing to say! The Internet is rapidly making statements of this sort impossible. We have already seen an example of it in the Red Decree: my French colleagues thought that only four copies existed, and I was very excited when I discovered a fifth in Oxford; we now know that there are at least fifteen. I’m wondering how many rare Chinese books there will be in our collections once my project is complete. During Piet’s lifetime, the Internet had not yet become the indispensable scholarly tool that it now is, and despite his acceptance that the computer was the way forward (he was far too shrewd to be Luddite in this matter), he never used one. When we closed the card catalogue in the Oriental Reading Room, he would ask me a little nervously to find books for him “on the screen”. Two further copies of Jiading meiquan bayin 加訂美全八音 are to be found, in the C.V. Starr East Asian Library of the University of California, Berkeley, and in Yale University Library. Their existence was revealed to me by entries in WorldCat, which also shows that the California copy has been scanned, and is contained in the HathiTrust Digital Library. Grotesquely, the full text seems to be unavailable outside the United States “due to copyright restrictions”. Li Chunxiao 李春晓 made the work the subject of his doctoral thesis at Fuzhou Normal University in 2002 (加订美全八音音系研究), and published and article about it in 2003 (福州方言韵书《加订美全八音》, 辞书研究 2003:4, 128-134). According to Li, its author Zhong Deming 鍾德明 was in the employ of Fuzhou Gezhi High School 福州格致中学, the oldest missionary school in Fujian province (it was founded in 1846, and is still in existence), and he got the teachers and students of this and Wenshan 文山, another missionary school, to collaborate in its compilation. Although the missionaries R.S. Maclay and C.C. Baldwin had published An alphabetic dictionary of the Chinese language in the Foochow dialect in 1870 (Methodist Episcopal Mission Press), with a revised edition appearing in 1898, this was presented in English and arranged alphabetically, and was thus inaccessible to Chinese readers. I’m rather struck by the manner in which Li obtained this information about the book’s background. It was due to a chance meeting with Zhang Guoying 張國英, a retired teacher from Changle No.1 Junior High School 長樂第一中學 whose paternal grandmother Zheng Zhang Zeng’en 鄭張增恩 had been a pupil of Wenshan, and actually participated in the dictionary’s compilation. I wonder if this explains how Li had access to the work in China – so far I haven’t been able to locate a copy there. The digital copy would not have been available then, and in any case it is inaccessible outside the United States. Perhaps Zhang Guoying has one, which he got from his grandmother. The words are arranged first by their final sound (the vowel and final consonant, if any), and within that by their initial consonant, and then each of the resulting syllables is arranged by tones, of which there were originally eight, hence the title Pa yin 八音. 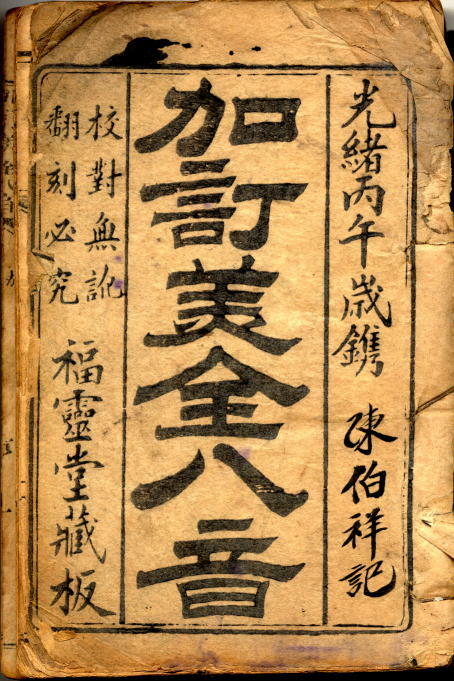 Although Zhong’s dictionary is presented in Chinese, and is blockprinted, it does not entirely dispense with romanisation. In fact, the heading for each syllable is its romanised form, printed white on black so that it stands out clearly on the page, starting with lŭng 巃, whose pronunciation is formed by the initial consonant of liu 柳 followed by the vowel and closing part of ch’ung 春. The small size of the edition and the poor quality of its physical production indicate that it was designed for practical use rather than to grace the shelves of a bibliophile. This probably accounts for its rarity. 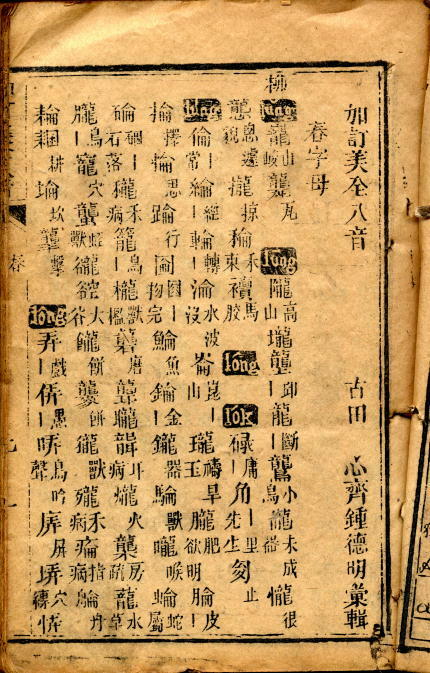 Piet gives a brief account of these early dialect books in Part 2 (pp.125-126) of The Manila incunabula and early Hokkien studies (Asia Major NS13, 1967, 95-186), but does not mention Jiading meiquan bayin, suggesting that he may not have acquired his copy by that time and so didn’t know it existed. Nor does he mention the Bodleian’s copy of Qi Lin ba yin, being aware only of copies of the 1841 edition in the British Library and the Royal Asiatic Society’s Chinese collection, now in the Brotherton Library at Leeds.